Francesco Casagrande took command of the Giro in stage nine and attempted to exert a Merckx-like control. But Francesco Casagrande wasn't Merckx and by the time the last mountain stage, he was showing signs of wear and tear. He kept the lead until the penultimate stage, a hilly time trial. There Stefano Garzelli did the ride of his life and won the 2000 Giro. Marco Pantani was able to finish the race, finishing 28th and towards the end showed flashes of brilliance. José Enrique Gutierrez (Kelme-Costa Blanca) s.t. Juan Carlos Dominguez (Vitalicio Seguros) s.t. Robbie McEwen (Farm Frites) s.t. Tayeb Braikia (Linda McCartney) s.t. Moreno Di Biase (Cantina Tollo) s.t. José Luis Rubiera (Kelme-Costa Blanca) s.t. Andrea Noè (Mapei-Quick Step) s.t. Hernan Buenahora (Nectar-Selle Italia) s.t. Mario Cipollini was first, but was declassified for not holding his line in the sprint. Miguel Angel Martin Perdiguero (Vitalicio Seguros) s.t. Ciaran Power (Linda McCartney) s.t. Mauro Gerosa (Amica Chips) s.t. Angel Vicioso (Kelme-Costa Blanca) s.t. Ruber Albeiro Marin (Nectar-Selle Italia) s.t. Wladimir Belli (Fassa Bortolo) s.t. Paolo Lanfranchi (Mapei-Quick Step) s.t. Axel Merckx (Mapei-Quick Step) s.t. Massimo Giunti (Cantina Tollo) s.t. Fabiano Fonatelli (Mercatone Uno) s.t. Hernan Buenahora (Nectar-Sella Italia) s.t. Filippo Casagrande (Vini Caldirola) s.t. José Enrique Gutierrez (Kelme) s.t. José Joaquim Castelblanco (Kelme-Costa Blanca) s.t. Dario Frigo (Fassa Bortolo) s.t. Andrea Farrigato (Fassa Bortolo) s.t. Andrea Peron (Fassa Bortolo) s.t. Ruber Alveiro Marin (Nectar-Selle Italia) s.t. Orlando Sergio Gomes (Banesto) s.t. Pavel Tonkov (Mapei-Quick Step) s.t. Victor Hugo Peña (Vitalicio Seguros) s.t. Mauro Gerosa (Amic Chips) s.t. Davide Bramati (Mapei-Quick Step) s.t. Moreno De Biase (Cantina Tollo) s.t. Giampaolo Mondini (Cantina Tollo) s.t. The Italian government passed a law making it a crime to dope in sports. On May 5, eight days before the Giro was to begin, the great Gino Bartali passed away in his hometown of Florence. Over his career “Gino the Pious” had won the Giro three times, the climbers’ competition seven times and the Tour de France twice. The man rightly nicknamed the “Man of Iron” was one of the greatest riders in the history of the sport. The 83rd Giro seemed to have “climber” written all over it with 23,000 meters of elevation gain and three hilltop finishes. Gotti wanted to erase the stigma of what some saw as his tainted 1999 win. This view was unfair: he had been the best rider to compete within the rules. Also entered were Tonkov, Simoni, Casagrande and Pantani’s teammate Stefano Garzelli. And what of Pantani? He took his disqualification harder than any other racer, ever. Convinced he was the victim of a conspiracy to defraud him of the 1999 Giro, he secluded himself in his house while an army of reporters and photographers camped outside. 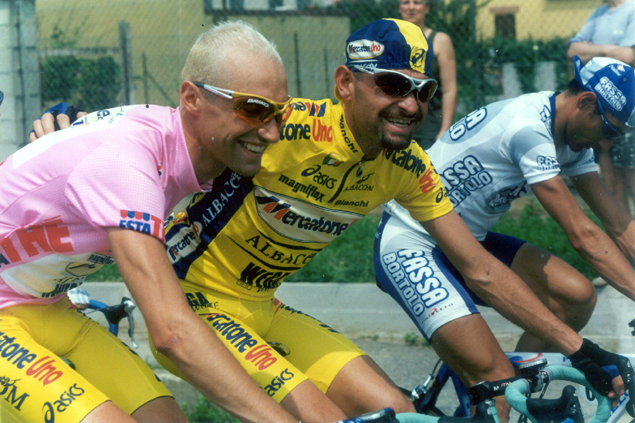 A few days after his expulsion Pantani began his descent into addiction and by June he was a regular user of cocaine. Meanwhile, symbolizing Italy’s state of denial regarding Pantani, Italy’s Prime Minister awarded Pantani the Collar for Sporting Merit. During this time Pantani had stopped riding and the combination of poor condition, ruined mental state and cocaine use rendered a 1999 Tour attempt impossible. While his fellow riders and team manager were aware of his drug problems by early 2000, for years Pantani and his circle continued to hide his cocaine use from the team’s sponsors and unbelievably, the team doctor. A judicial investigation was launched into Pantani’s disqualification and almost simultaneously the Turin prosecutor opened an inquiry into the weird blood values technicians found when Pantani crashed in 1995. When his broken body was brought to the hospital his hematocrit was over 60 percent and Pantani was therefore potentially guilty of the crime of “sporting fraud”. Meanwhile in Ferrara, an investigation into the good Doctors Conconi and Ferrari had yielded a gold mine of data after computers seized at Conconi’s offices were made to spill their guts. The cream of Italian cycling was implicated in an extensive doping program, all documented with meticulous notes. Among the riders were Bugno, Chiappucci, Fondriest, Gotti, Ugrumov and Pantani. Information from the files was published in the daily La Repubblica in December and showed that Pantani’s blood had been manipulated since at least 1996. As in the 1998 Tour scandal, where Festina found its sales soaring as its team fell into disgrace, many of Pantani’s sponsors found the publicity windfall helped business and were eager to use him to publicize their products. 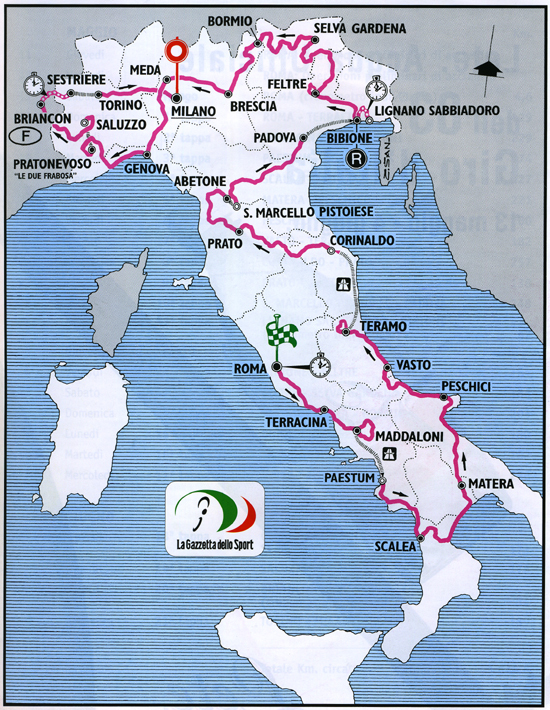 In January of 2000 Pantani announced that the Giro and the Tour would be the centerpieces of his season. He spent part of the winter training in the Canary Islands. As the early season races drew nigh he postponed his racing start, feeling that things were not “tranquil”. Before the riders could race, they were all subjected to blood tests. One rider failed to pass, Evgeni Berzin. With too many red blood corpuscles, he wasn’t allowed to start and his team, Mobilvetta, quickly sacked him. The Catholic Church proclaimed 2000 a Jubilee year, so the Giro started with a 4.6-kilometer prologue bouncing over slippery cobbles starting at the Vatican and finishing in Rome. Czech rider Jan Hruska won, beating Paolo Savoldelli by a fraction of a second. Cipollini was only a second back, putting himself within stage-win time bonus of the Pink Jersey. Pantani finished near the bottom of the standings, 40 seconds down. 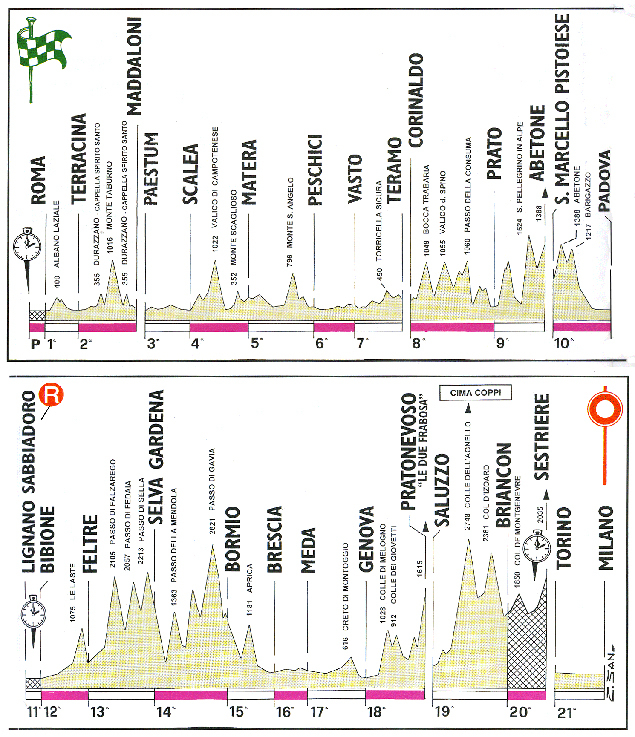 Stage one was a short 125 kilometers south to Terracina. Cipollini gained enough time in an intermediate sprint to take the lead, but decided the final sprint was too dangerous and was content with the maglia rosa as Ivan Quaranta beat the other speedsters. For their stage two journey into southern Italy, cold, rainy weather greeted the racers, which seemed to have cooled their racing ardor. A seven-man group with Cristian Moreni escaped and was never seen again. A few kilometers from the end in Maddaloni, Moreni jumped away from his breakaway companions on a small hill, beating the break to the finish line by 5 seconds and the peloton by another 25, moving the lead from Cipollini to Moreni. Stage four, into Matera in the heel of the Italian boot, allowed Cipollini to claim his 30th stage. It wasn’t pretty because there was a substantial hill in the day’s route that should have left the Lion King gasping for air and unable to maintain contact with the peloton, but the television cameras told the dirty story. Cipollini got pushed up the hill by his gregario Mario Scirea while the judges pretended not to know about it. Furthermore, Cipollini gregario Giuseppe Calcaterra hit Freddy González in the head for attacking while Cipollini was being helped. With its short climb to the finish line in Peschici on the Adriatic Coast, stage five offered a first real peek at who was ready to race. Matteo Tosatto took care of business early when he won an intermediate sprint and earned enough bonus time to make him the virtual leader. Later, when the day’s break took off, Tosatto’s team didn’t chase; they had no plans to waste energy defending his lead when they knew he couldn’t take it to Milan. They were keeping their powder dry for their Classification man, Wladimir Belli. It turned out Fassa Bortolo could have their cake and eat it too when the peloton came together before the sprint, preserving Tosatto’s lead. The next couple of stages were ridden piano, but stage eight, raced over three ranked climbs, had some great, tongue-hanging, lung-searing racing. With about 50 kilometers to go, a small group containing Gutiérrez got clear and was joined by a trio containing Di Luca. The chase was on (I’m astonished that such a high quality group was allowed to get away) and after some hard-driving riding, the breakaway emerged in Prato 49 seconds ahead of the peloton, making Gutiérrez the new leader. That was just a warm-up. The next day had a hilltop finish at Abetone, but before they did that ascent, the riders had to get over the San Pellegrino where the peloton came apart. The better riders each took a pull and the speed kept increasing. Pantani, not unexpectedly, was shelled. His ever-vigilant team surrounded him and did their duty, shepherding the out-of-form superstar to the finish. Further up the hill Francesco Casagrande took his turn applying the pressure and only Danilo Di Luca could stay with him. Casagrande put the gas pedal down a little closer to the floor and still Di Luca clung to his wheel. Casagrande kept going harder and harder until finally Di Luca couldn’t take it, letting Casagrande go. A chase group of the rest of the best formed: Simoni, Tonkov, Gotti, Frigo, Belli, Di Luca, Noè and Garzelli. Casagrande was spitting out watts as if the race would end tomorrow and held his lead to the end, beating the Garzelli-lead group by 1 minute 39 seconds. Casagrande was the maglia rosa. It was a gutsy move and an impressive display of authority. It’s always something at the Giro. The Association of Italian Cycling Teams began a mini-strike of sorts. The riders refused to talk to the press or attend the podium presentations. They were demanding RCS Sport give the teams a share of the television and merchandising license fees. RCS said this could be discussed after the Giro was over and the teams agreed. I don’t think anything came of it. Forty-two kilometers of time trialing was enough to tighten up the Giro before the first rest day. Casagrande lost time to all of his challengers, and after a week and a half, the race was virtually a tie among the top six places. A sign that the high mountains had arrived was Mario Cipollini’s withdrawal from the race. He did not start stage thirteen with the Falzarego, Marmolada and Sella ascents looming; abandoning must have seemed easier than having his team beat up all the climbers. Part way up the Marmolada, after his gregari had done what they could to break the peloton, Casagrande snapped everyone’s neck with a hard acceleration. That was it for Tonkov. Then from the small lead group, Di Luca, who had been riding well beyond anyone’s expectations, came off. Casagrande and Garzelli hammered away at each other on the way up, spewing riders out the back. Over the top, Simoni got a gap on the others with José Luis Rubiera able to catch him on the descent. Rubiera won the two-up sprint in Selva Val Gardena, followed by Garzelli and Casagrande 31 seconds later. Casagrande now had a 31-second lead over Garzelli. 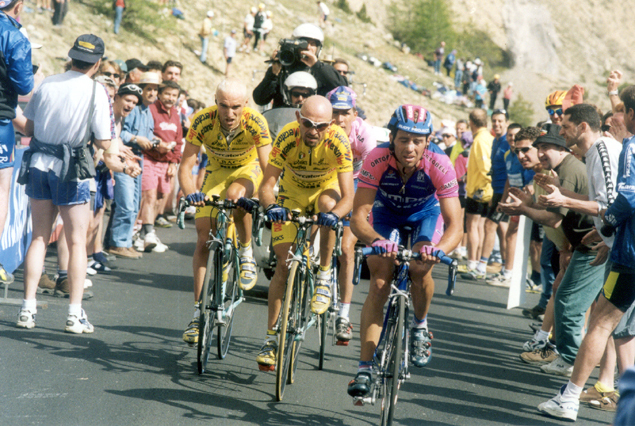 Gilberto Simoni leads Pantani, Garzelli and (hidden) Francesco Casagrande. Three more big ones, that’s what faced the riders in stage fourteen: the Mendola, Tonale, and the south face of the Gavia followed by a monster-gear rip down into Bormio. Things broke up badly on the ice-cold ascent of the Gavia, but it was the descent that really decided things, as the more skilled and powerful riders passed those who would rather not go soaring off the dangerous road. The Gavia doesn’t have many guardrails and there are times when the rider just has to gulp and hope his tires will hold. 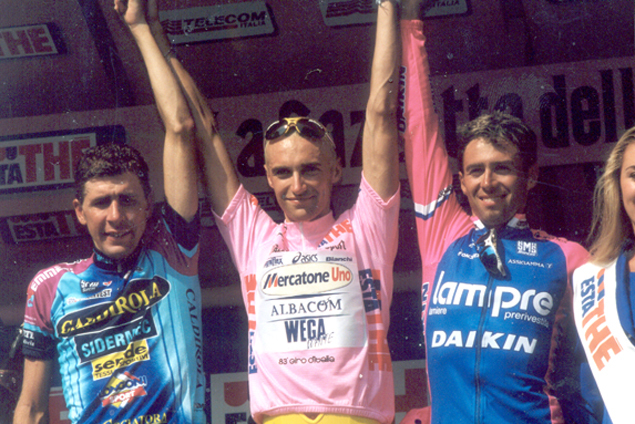 A group of four coalesced: Casagrande, Belli, Eddy Mazzoleni and stage winner Simoni. Frigo, Gotti and Garzelli chased hard, but they ran out of stage before they ran out of gap. The race came out of the high mountains and raced to Liguria. During these mostly easier stages, there were no serious challenges to Casagrande’s lead. But stage eighteen, heading north from Genoa, went right into the Piedmontese Alps with a hilltop finish at Pratonevoso. Di Luca, troubled with tendinitis, abandoned. The Giro was wearing on Casagrande as well. He no longer rode with the same impregnable authority he had shown in the first stages. That and the closeness of the standings meant the stolid-faced Casagrande was probably in for some rough handling. Midway up the final climb, a rejuvenated Tonkov was the first to cuff the maglia rosa. Simoni and Garzelli gave him a couple of kicks but Casagrande stuck around. Then Simoni attacked and when Garzelli closed up to him, he was without Casagrande. As the road flattened slightly, Casagrande dragged himself back up to the leaders. Garzelli, being a good sprinter, took the stage and the bonus seconds, putting him within 25 seconds of the lead. Simoni was still third, now at 53 seconds. No rest. Stage nineteen had the 2000 Cima Coppi, the Colle dell’Agnello, followed by the Izoard and an uphill finish in Briançon. The best riders separated themselves from the peloton on the Agnello and managed to stay away on the descent. One rider managed to join the leaders and was he a surprise! It was Marco Pantani. In the third week he had found his legs. As the Izoard started to bite, Simoni did a probe and found Tonkov didn’t have what he had the day before. Then Pantani went hard to get up to Simoni but Garzelli couldn’t hold his wheel. After the leaders came together, Pantani attacked again, marked by Simoni. Pantani relented and waited for Garzelli. Simoni kept banging away the entire way up the Izoard while Pantani did the job of bringing the others up to him. This entire distance maglia rosa Casagrande just watched without taking part in the fireworks, letting the others wear themselves out. On the descent before the climb into Briançon, as the big dogs watched and marked each other, Paolo Lanfranchi, a gifted gregario of Tonkov’s, took advantage of the slower pace to take a flyer. Further on Pantani gave chase. Too late. Lanfranchi won the stage; Pantani was an astonishing second and Simoni, Garzelli and Casagrande followed in at a minute. Garzelli said that he had hoped to conserve his energy as much as possible over this stage with the time trial coming the next day. Pantani had made sure everyone had worked hard. The penultimate stage was a 32-kilometer time trial going from Briançon up to Sestriere with the Montgenèvre mountain pass in between. Jan Hruska, who won the prologue, was also victorious in the final time trial. Garzelli rode a perfect race, coming in third. And Casagrande? He looked awful, losing 1 minute 52 seconds to Garzelli and therefore, the Giro d’Italia, and he nearly lost second place to Simoni. Casagrande, ranked the number-one rider in the world, looked to have burned himself up trying to ride with Merckx-style authority. In his defense, he said he was suffering from sciatica and felt he could have won the Giro if he had not been suffering from the nerve problem. Stefano Garzelli on the final podium with Francesco Casagrande (left) and Gilberto Simoni (right). Garzelli, a fourth year pro, had won the Giro in his fourth attempt. So far his career hadn’t been spectacular, since he was primarily a gregario, but it did show the promise of what he could do. In 1997 he was ninth in the Giro, in 1998 he won the Tour of Switzerland and in 1999 he won the GP Miguel Induráin and was fourth in Milan–San Remo. His next challenge was to get a different nickname. During the Giro, to his chagrin, the press had begun calling him “the Little Pirate” (il Piratino). With the Giro under his belt, Pantani had the beginnings of some of his old racing form and went on to enter the Tour de France, giving Lance Armstrong fits before retiring with stomach troubles. In December, as a result of the Turin hospital investigation, he was found guilty of sporting fraud and was given a suspended sentence which was later reversed because it was found that the law did not apply in Pantani’s case. Meanwhile his cocaine use and the investigation into his ejection from the 1999 Giro continued. Oh, and about that green Climber’s Jersey Casagrande took home. On the last day González was leading in the Mountains classification. Then, after some complicated explanations, Casagrande was awarded the maximum possible points for the climb in the final time trial and with that, was given the Green Jersey. The Colombians of González’s Aguardiente-Nectar team were outraged at the dubious calculations.